Commemorate that special occasion forever with our Laser Engraved Heart Keepsakes. Transform this crystal memento by adding your own custom text and picture. 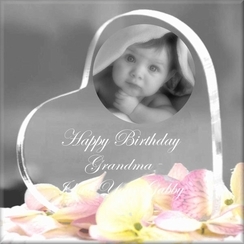 Beautiful laser engraved pictures and text have a magnificent look that is sure to put a smile on their face. It is a unique gift that is guaranteed to last generations. The laser engraving will show a crisp white with the clear acrylic for an elegant high contrast. You can use this piece for a paperweight, a decoration or as a cake topper keepsake for weddings, anniversaries, birthdays, retirements or any special occasion.